For those without comedic tastes, the "questionable parody" of this website called Wikipedia have an article about Richard M. Stallman. 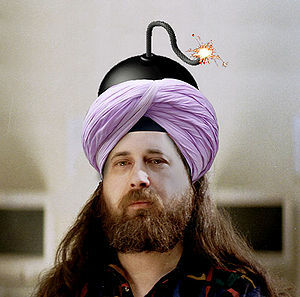 Richard Malodorous Stallman (born March 16, 1953), also known as "rms", "GNU/Stallman", 'Richard M. Stalin' and sometimes Karl Marx, is the author and most prominent proponent of the Grand Unified Theory of Free & Accessible Technology (GUTFAT), and the founder of the GNU. GNU is a clever and descriptive but decidedly non-recursive acronym standing for Generally Not Used. Essentially, rms's theory states that it is more important for software to be free than to be usable. In later years he became the spokesperson for other freedom movements including free love, free Tibet, and free Whopper® with the purchase of a Whopper Ultra Value Meal®—for a limited time only, prices and participation may vary. "Hearken, my brethren! The time has come! Together we shall crush the oppression of proprietary software and free mankind from the evil clutches of corrupt corporations!" While rms himself is sketchy about exact details of his origin, according to "The Hacker's Dictionary" he was inadvertently created in a polymer factory in 1953. A disinterested employee was searching for a suitable dumping ground for a surplus of wax, liquid rubber and epoxy plastic. When he discovered that all the trash receptacles were full and all the casting molds were in use, he dumped the strange concoction into a blob on the floor, with the intention of perhaps getting around to cleaning it up later (maybe next week, if he had nothing better to do, and if his boss threatened to fire him otherwise). A joyful reunion: The polymer factory worker revisits rms on his first birthday. Some time later, rms entered prestigious Harvard University—apparently by hanging out by the loading dock of the maintenance entrance disguised as a blob of wax, liquid rubber and epoxy plastic... and then slithering inside when the Security Guard wasn't looking. While unpopular with women ("Rancid muddy stain! Rancid muddy stain! "), his typing was impeccable, and rms was able to graduate from Harvard in 1974 with a BA in physics, mostly by taking computer-based proctor-graded courses where no actual contact needed to be made with professors. During the same period, he was able to squeeze under doors and through mail slots at the MIT Artificial Intelligence Lab, where he enjoyed a rewarding (if somewhat non-consensual) relationship with the facility's PDP-10 computer. In January 1984, rms sustained severe chemical burns when he met the business-end of a disinfectant squirt bottle, wielded by a perplexed janitor who believed him to be the developing fungi of a professor's forgotten coffee cup. He fled from MIT, disks held securely in his folds and orifices, to begin the GNU project. One of the his first non-programming works—the GNU Manifesto—was a certifiable snore-fest, later adopted by a commercial enterprise, repackaged, and sold on the industrial pharmaceutical market as a sedative for invasive surgery. It detailed the harsh political realities facing discarded industrial materials in their class vs. class struggle against carbon-based bipedal bourgeoisie. And, there was also some mention of the design and creation of a free Unix-compatible operating system—but no-one was able to read to that point until the popular availability of No-Doz. In search of some sense of belonging, rms was briefly affiliated with a dangerous group of plastic explosives during his late teens. With his noodly appendages calloused and sore, rms found himself sadly defeated, unable to create a functional kernel to complement his array of system tools and complete the GNU Operating System. 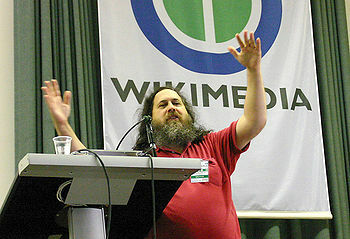 He assembled a team of programmers from his network of poly-sympathizers, then gave them the mission and their guiding slogan: "Technology Unlimited, Radical Development"
So, GNU's Project TURD was begun in earnest in the new decade of 1990, but it soon became clear that the excruciating squeeze to produce a revolutionary package was in fact, waste, owing to a crappy design decision. The public, who'd been waiting patiently by the door for some time, eventually moved on to the fertile pastures of Linux, and GNU's offering was flushed. While he may have begun life as a flexible, almost malleable entity, rms is now described by most as being extremely difficult to work with. The XEmacs team, for example, catalogued a list just shy of 10,000 specific complaints about working with rms that led them to tell him to fork off their project. Leading experts in the field of polymer chemistry have speculated that rms' base materials are slowly hardening with time, but are unable to determine why, or whether the condition is reversable. Historically, rms has been extremely guarded about being touched and is vehemently against providing any tissue samples, so the truth may never be known. 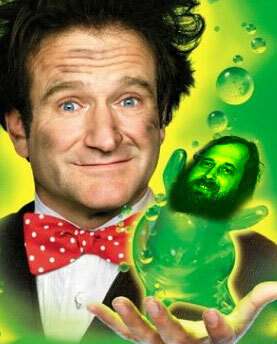 However, it is postulated that by the time of his death, his own preserved remains will be able to serve double-duty as a tribute statue at GNU Headquarters in Boston, Massachusetts. He is the composer of the Free Sockpuppet Song, and has been known to perform it on the recorder, or folk-slither to it when others play it. He cannot swim, but floats majestically. He once received a custom-made sail from Microsoft chairman Bill Gates, but has steadfastly refused to wear it, despite the fact that it was "free". In his Personal Ad, rms declares himself as well rounded, not as dense as people think, and proud of his achievements despite his meagre beginnings on the factory floor. His religion forbids bathing and shaving for non-actors as it is insulting to the gods. Despite the fact that his name can be read as Richard M's tall, man!, he is actually under three feet in height. He had his name legally changed from 'Ignucius Richard M. Stallman' because his initials could be interpreted as 'I R MS'.